There are nebula called "ghost nebula", but this is the nebula that should be called "The Ghost". My new camera is being a bit difficult. It is USB cable sensitive. It sometimes will, and sometimes won't, work through the USB hub. It likes the cable that came with it, which is long, but not long enough. That cable with a 25 ft active extension cable to the laptop works. With the few hours of clear sky, sorting that all out becomes a time bandit. I am sure that no one else has these problems. 10" f 3.9 Newt on AZ/EQ6 mount w/ SBIG STF 8300m camera. 18 @ 360 sec of Ha w/ darks, flats, bias, and dark skies. Not cropped, I use PI to stack and PS to stretch. I am a work in progress. With clear skies I will try again with longer subs. An Edit. 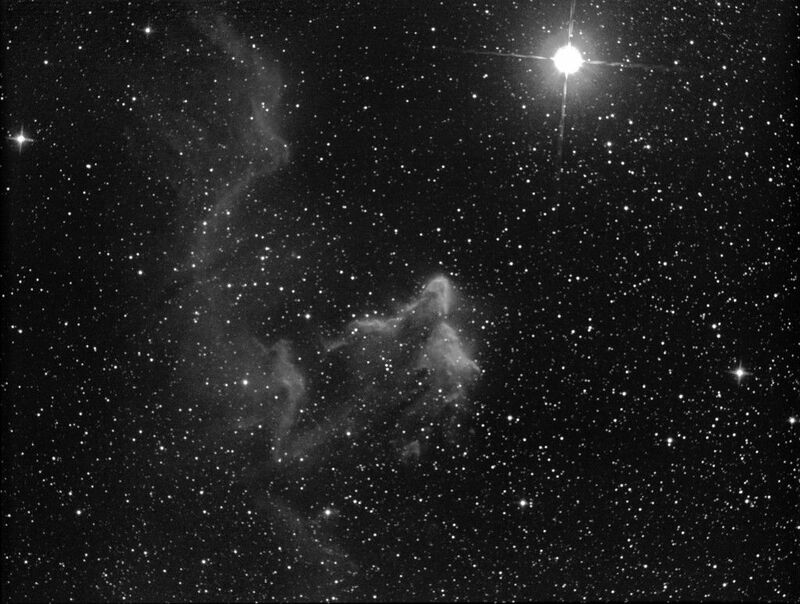 I understand that the IC 63 part is referred to as "Ghost of Cassiopeia" or as Roger says "The Grim Reaper". Last edited by rwillits on Sun Feb 07, 2016 3:47 pm, edited 1 time in total. Last edited by mick on Tue Feb 09, 2016 11:37 pm, edited 2 times in total.